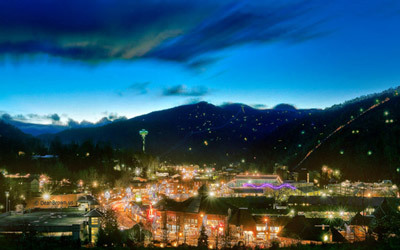 Planning a Gatlinburg, TN vacation? Make the most of those unused vacation days with these fun tips on how to take your itinerary up a notch! We've got the list of the best Gatlinburg vacation ideas for families, couples, and groups visiting Gatlinburg in the Smoky Mountains. 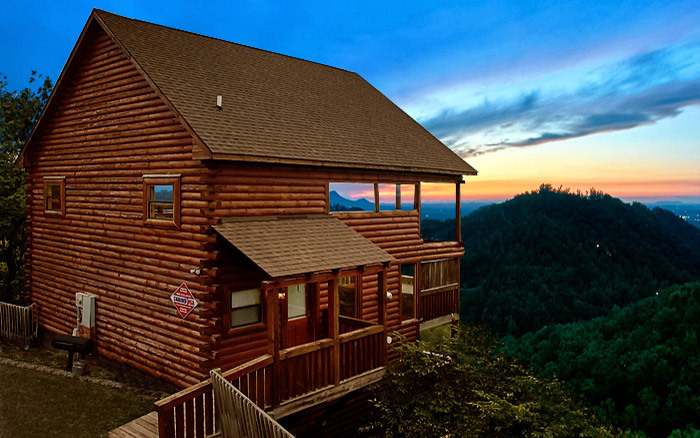 Start your Gatlinburg vacation off right by renting a log cabin. Not only are rentals convenient for seeing the best that Gatlinburg can offer, they've got more amenities and space than similarly priced hotel rooms. When you're sitting back in your cabin's hot tub with a gorgeous mountain view, you'll be glad you booked a cabin rental in Gatlinburg. The Great Smoky Mountains National Park is over 800 Square miles in size. This makes the Smokies the biggest playground for outdoors enthusiasts in the Southeast. Whether you want to see beautiful waterfalls or climb tall mountain peaks, there is a hiking trail in the Smokies for you. What's a good vacation without chowing down on a delicious dinner? There are restaurants to suit any mood or occasion, but The Pancake Pantry or the Cherokee Grill offer a unique taste of Gatlinburg. 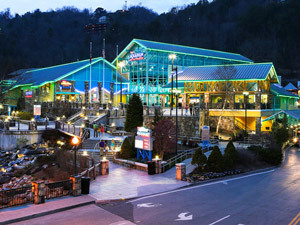 It's hard to miss the stunning Aquarium of the Smokies in Downtown Gatlinburg and it's even harder to imagine a Gatlinburg vacation without a stop at this top-rated attraction. See playful penguins, fearsome sharks, and floating jellyfish at this aquarium with interactive displays and a marvelous collection of sea life. 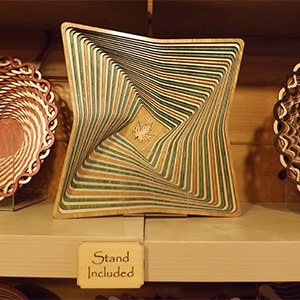 A stroll in downtown Gatlinburg will take you past many one-of-kind specialty shops. Whether you visit Paula Deen's cooking store of the Village Shops, it's easy to browse for hours in the heart of Gatlinburg. Mini golf courses can be cheesy, but let's admit it - they were undeniably cool when you were a kid. Gatlin's Fun Center in Gatlinburg is a unique course to play. If "putt putt" isn't your cup of tea, the nearby Gatlinburg Golf Course offers 18 holes with the gorgeous Smoky Mountains as your backdrop. It's a little known fact that Gatlinburg is home to all manner of ghosts and ghouls. Brave vacationers can test their nerves at Ripley's Haunted Adventure or the Mysterious Mansion. Gatlinburg is also home to ghost tours that tell spooky stories of spirits said to haunt downtown to this day. See the Smoky Mountains from a unique perspective – hundreds of feet in the air! There are many local companies that offer flying tours of the Smoky Mountains and Gatlinburg, Scenic Helicopter Tours is one of the most extensive aerial tour companies in the region. Moonshine and Muscadine wine have come a long way since their humble origins as the chosen drink of mountain settlers. Now in Gatlinburg, you can experience the history, heritage, and flavors of moonshine at one of the many distilleries in downtown. Stop by the Ole Smoky Moonshine Distillery to sample some shine and maybe bring a jar home for yourself. If you aren't a fan of "the hard stuff, " Gatlinburg is also home to Sugarlands Cellars, where visitors can sample a variety of wines for free. For a fantastic evening on the town, it's well worth checking out some of Gatlinburg's shows and performances. Guests can find magic acts, hypnotists, and illusionists at the Iris Theater in the Space Needle. For a truly unique show, reserve seats at Sweet Fanny Adams, a hilarious musical theater styled after the burlesque comedies of yesteryear. Thousands of people made the Smoky Mountains their home before the National Park was established in 1934. 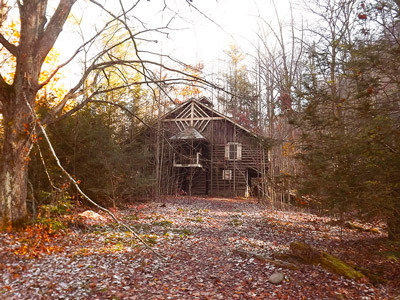 Vacationers in the Smokies can still see their legacy in the many abandoned structures throughout the park. Cades Cove and Elkmont are hot beds for finding old, abandoned homes, but many more cabins and homesteads can be found on hiking trails and roadways in the Smokies. Gatlinburg is home to an impressive variety of museums that cover everything from bizarre factoids to local history. Ripley's Odditorium in downtown offers dozens of unbelievable exhibits. For a crash course on Smoky Mountain history, visitors can explore the national history museum at Sugarlands Visitor Center in the national park. A great vacation idea is to commune with nature on horseback when you visit beautiful Smoky Mountains. Cades Cove Riding Stables is one business that takes guests on beautiful trails in the most iconic valley of the Smokies. Explore the tree tops of beautiful Smoky Mountain forests when you ride exciting zip lines! One of the most convenient tour companies is Zip Gatlinburg. This outfitter boasts a course within the city limits that offers great views of Gatlinburg and the Smokies. Ober Gatlinburg is well known as Tennessee's only ski slope, but it offers far more than winter sports like snow tubing and skiing. Indoor ice skating is available year round as well as an alpine mountain coaster. The Smoky Mountains offer some of the best fly fishing in the Southeast. With proper permits, angler's can venture into the national park or fish streams within the Gatlinburg city limits. Visit the Smoky Mountain Angler to get the local scoop and gear needed for a great fishing trip in the Smokies. 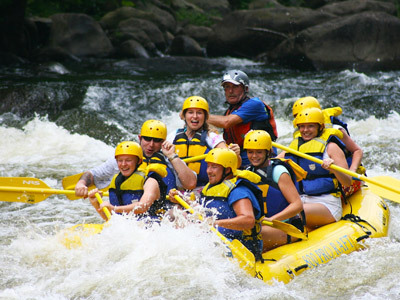 Ride the rapids of the Little Pigeon River near Gatlinburg! Several local outfitters offer whitewater rafting trips on the Upper and Lower runs of the river which includes 12 class III rapids and 3 class IV rapids. The upper section is a more extreme ride, while the lower river is more mellow. Both routes are gorgeous and riding the rapids is a blast! Old timey photographs definitely fall in the goofy vacation activity category. But where else can you get dressed up like desperados, western ladies, and cantankerous, old prospectors for kicks? Downtown Gatlinburg is full of western costume photographers that are happy to give you a vacation memento you can treasure (and laugh at) for a lifetime. There's plenty of goodies around every corner in Gatlinburg, TN. Like most tourist towns, there are plenty of places to find delicious fudge. One of the more unique sweet shops is the Smoky Mountain Candy Kitchen that makes authentic salt-water taffy with a machine built in the 1940s. Another Gatlinburg destination is The Doughnut Friar, a doughnut shop that has been making old-fashioned, handmade doughnuts for over 45 years. Get lost in Ripley's Mirror in the heart of downtown for some delightful family fun and special effects. This vacation idea is a great fit for families with children. Drive to elevations 6,000 Ft. above sea level by taking the Newfound Gap Road. On your way, you'll pass many beautiful overlooks that make for great photo opportunities. 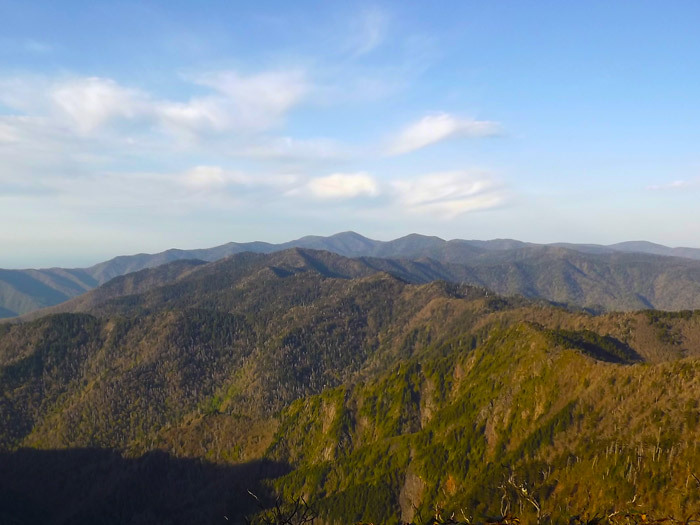 The parking area at Newfound Gap offers gorgeous vistas and a chance to see the Appalachian Trail, but drivers can continue further on the 7 mile Clingman's Dome Road to the highest point in the Smokies. For even more vacation ideas in Gatlinburg, check out our seasonal events calendar to help plan your trip. You never know what will be going on in the Smoky Mountains when you plan your visit! There are a ton of fun things to experience in beautiful Gatlinburg, TN. As much as this list offers, it hardly scratches the surface of everything to do and see in the Smokies. Not to mention nearby Pigeon Forge and Sevierville, TN that have seemingly endless attractions and opportunities for family fun. To truly see all that Gatlinburg has to offer, just take a few more vacation days – you won't regret it.